Jens Stoltenberg had just turned 60 and addressed the US Congress, while the woman who propelled his political career and went on to lead the UN’s World Health Organization, Gro Harlem Brundtland, will turn 80 later this month. What better opportunity for the Norwegian Labour Party to hail two of its most internationally famous former prime ministers, and relive some of Labour’s glory days at the same time? 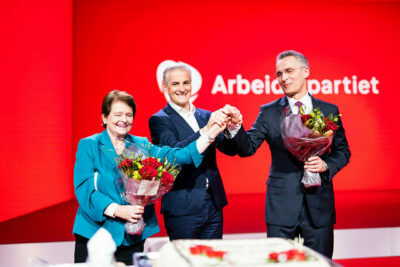 Stoltenberg and Brundtland were guests of honor when Labour gathered for its annual national meeting over the weekend. Internal political squabbling was set aside Saturday afternoon in order to pay tribute to both, hear them speak again, enjoy some nostalgic old photos, present flowers and and let them eat cake. The salutations were well-deserved, wrote political commentator Arne Strand, who’s followed the Labour Party for years. 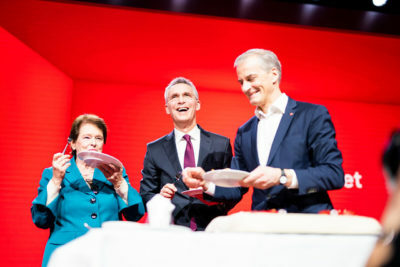 While Brundtland led Norway during three periods in the 1980s and ’90s, and made international headlines over all the women in her cabinet, Stoltenberg also served three times, and was re-elected in 2009 largely, it can be argued, because he was at the helm. There are more similarities between the two. Both are academics, come from the relatively affluent west side of Oslo and had parents who were government ministers. They both joined Labour early and came of age in its youth organization AUF, which later was the target of a right-wing extremist’s deadly attack in 2011. They also both won bitter power struggles over rivals within the party, and later were recruited to major international positions. On Sunday, many Labour Party members were just wishing that Stoltenberg, at least, would eventually “come back home” and take over Labour again. That may be unlikely. Some note, though, that if a Labour-led left-center coalition wins the next national election in 2021, Stoltenberg’s second term at NATO would end shortly thereafter. That could make it possible for him to return as Norwegian foreign minister for current Labour leader and prime minister candidate Jonas Gahr Støre. That in turn would make for a reversal of roles from the days when Støre was Stoltenberg’s foreign minister from 2005 until Stoltenberg needed him to take over a crisis-ridden health ministry towards the end of his second term. Others speculate that Stoltenberg may move on to bigger things, and eventually be asked to become secretary general of the UN. There’s no question he was a hit in Washington DC last week, when he because the first NATO secretary general to address a joint session of Congress. 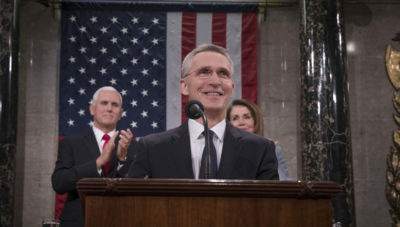 His lively, engaging and often personal address (external link to NATO’s tape of his address) led to numerous standing ovations, and also left senators and representatives laughing on several occasions as well. He brought some good humour to an assembly that’s been more polarized than ever of late, just after he’d also managed to humour and win accolades from US President Donald Trump. There were also smiles and laughter on Saturday, after Stoltenberg flew back to Europe and up to Oslo for the weekend. Many Norwegians have noted that they were proud. Labour was too, of both Jens and Gro, and let them know it.